FIG. 7.48.6 Recovery-capacity performance curves for conveyor centrifuge. Sludge Description Legend: A, converter paper mill, coated paper; B, kraft mill, boxboard and coated paper; C, cold rolling mill, clarifier sludge; D, sewage, raw limed primary clarifier, classified without polymer; E, sewage, raw limed primary clarifier, treated with 1.5 lbs. anionic polymers added per ton dry feed solids; F, raw tannery waste; G, sewage, raw primary clarifier; H, sewage, raw primary plus secondary biological sludge; I, sewage, anaerobic digested primary plus secondary biological; J, basic oxygen furnace scrubber liquor. FIG. 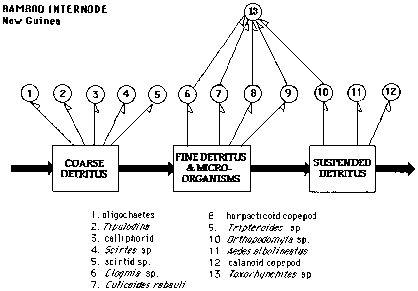 7.48.7 Recovery response to polyelectrolyte addition in a conveyor centrifuge. clarifying scrubber liquors, recovering solids from packing-house and metals-treating waste, roughing out solids upstream of disc centrifuges on refinery sludges, and de-watering potash and mining tailings. 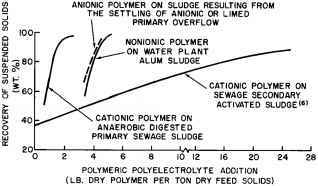 Controlled settling allows the recovery of calcium carbonate from limed sludge. 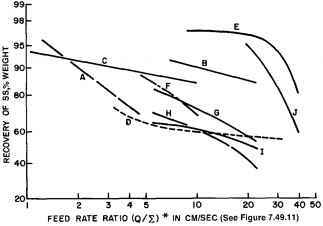 Figure 7.48.6 shows the expected solids recovery against feed rate ratios for a number of wastes. On municipal sewage sludges, comparing the G and H curves shows the effect of adding secondary biological sludge to primary sludge. Anaerobic digestion of the latter does not change the clarification characteristics markedly (I). The cake concentration depends largely on the sludge and can vary (see Table 7.48.4).